Jessica Lawrence is the Executive Director of NY Tech Meetup (NYTM), the largest Meetup in the world and a non-profit organization helping to build a sustainable and diverse technology industry in New York. Since joining NYTM in April 2011, she has grown its membership from 12,000 to over 42,000 and secured recurring sponsorships from major firms Google, Microsoft, Bloomberg, Tumblr, MLB Advanced Media, American Express, Thomson Reuters, Morgan Stanley, Facebook, and HBO. In 2013, she co-founded The Work Revolution Summit, a conference on the future of work. She also co-founded the Women in Tech NYC program, which amplifies the work of NYC organizations that are providing opportunities for women to enter the tech industry. I moved to New York in January 2011, and two weeks after I arrived, I went to my first NY Tech Meetup (NYTM) event. That night, they announced that NYTM was looking for its first full-time employee, an Executive Director who had non-profit management, fundraising, and event experience. That list of what they were looking for was almost an exact match to my resume. I then watched the rest of the two-hour event and was totally inspired by the innovative presentations featured on stage. I decided to apply for the job and started my work with NYTM about six weeks later. Tell us about NY Tech Meetup. What inspired the idea and what is your vision for the company? NY Tech Meetup is now the largest Meetup group in the world with over 42,000 members and a non-profit organization that builds programs and partnerships to support the growth and diversification of New York City’s technology industry. NYTM was originally founded in 2004 by Meetup.com founder Scott Heiferman and co-founded by Dawn Barber as a place where people building technology startups could gather to share what they were working on and support each other. 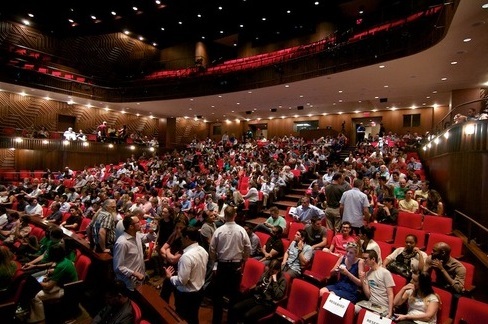 When it first started, the monthly gatherings happened in a conference room, but over the years, the monthly gathering grew to need bigger and bigger spaces, and our current home is now at the 850-seat Skirball Theater at NYU. Our vision has always been about creating community – helping people find and connect with each other so that they can accomplish their goals. As the city’s technology community evolves, we want to make sure that it reflects the diversity of New York City’s population. We believe that solving our biggest challenges requires a broad spectrum of perspectives and that the people designing, engineering, and building the products of the future need to be just as diverse as the people who will be using them. What strategic partnerships have you implemented that have attributed to NY Tech Meetup's success? NY Tech Meetup has been fortunate enough to develop a substantial number of partnerships over the years that have been crucial to our growth and our ability to have an impact in the community. There are far too many to list, but they range from partnerships with our founding sponsors Gotham Ventures and the law firm of Wilson Sonsini, to our annual sustaining sponsors like Google and Microsoft, to other community organizations and non-profits like Camp Interactive, Girls Who Code, Lesbians Who Tech, Coalition for Queens, and Silicon Harlem. Our partnerships with the public sector, from the City of New York to members of Congress, have been incredibly important as well. Partnership is a core part of our organization and community – we wouldn’t be able to have impact without them. One of the biggest trends in New York City has been growth – growth in every area of the technology sector. Technology is becoming a crucial component of every industry in New York City. This is not something I think about capitalizing on, but I do think about how we can play a role in making sure that this growth is inclusive, sustainable, and has the best possible impact on the city and the world. We don’t have an official motto, but given our focus on community, it might be something as simple as: through community, we flourish. Your greatest success as Executive Director of NY Tech Meetup? Most difficult moment-how did you overcome and what did you learn? It was most difficult at the beginning when I was a solo employee and had to cover every aspect of the work necessary to grow the organization. But that growth and our impact has also been the most rewarding part. And I’m looking forward to being able to do even more. I see so many entrepreneurs pitching products that are solutions to problems that barely exist or that only improve life incrementally. I’d love to see more entrepreneurs tackling big problems or tackling small problems that once solved have an exponential effect on making life and the world better. And I think it’s so incredibly important for entrepreneurs to really understand the problem they are trying solve, not just from their own perspective but truly from the perspective of those who have the problem in need of solving. Still being fairly new to New York City, the city itself still feels like a travel destination to me. I also love getting out of the city to the North Fork of Long Island or upstate along the Hudson River. A slice of chocolate cake with cream cheese frosting and a glass of milk. I usually have multiple books at the ready so that I have options depending on my mood. I am currently reading Let Your Life Speak by Parker J. Palmer and The Upside of Your Dark Side by Todd Kashdan and Robert Biswas-Diener. My role models are people who embrace their unique and authentic selves and bring that to the world every day. There’s amazing magic that happens when who you are in all aspects of your life is aligned. I love to bake, everything from soft pretzels to butterscotch pie to blackberry lavender scones. When I travel, I love exploring whatever baked goods are the local specialty. And I often look at the dessert menu before ordering dinner so I know how much room to save. About 50 million Americans live below the poverty line. What's next for NY Tech Meetup? We just launched a new membership platform that is integrated with Meetup.com, and we’re looking forward to continue to iterate on and improve that. And we’re planning our programs for 2015, looking at all the ways we can help support the community and what it needs now. Prior to her work with NYTM, Jessica was the CEO of Girl Scouts of San Gorgonio Council in Southern California, where she supported a community of 75 staff, 5,000 volunteers, and 15,000 girls. Jessica was one of only 15 women selected to participate in Seth Godin’s Female Entrepreneur MBA (FeMBA) in 2010. She has received numerous awards including the Girl Scouts of the USA Frances Hesselbein Award for Excellence in Management in 2007, was selected as one of The Daily Muse’s 12 Women to Watch in 2012, and as one of the Crain's New York Business People to Watch in Silicon Alley 2013. Jessica’s writing has been featured on the Harvard Business Review blog, Forbes.com, The Next Web, The Daily Muse and in a weekly column in The Press-Enterprise. She also speaks frequently on technology startups, the New York technology community, women in tech, organizational development and culture, the future of work, and non-profit management.